Historically, the Department of Water Resources’ Bulletin 118 identified two subbasins in the area now managed by the NDGSA: the Solano Subbasin (5-21.66) and the South American Subbasin (5.21.65). Furthermore, the NDGSA is working closely with other groundwater agencies located in the neighboring basin to the east, the Eastern San Joaquin Subbasin (5.22.01). All three of these basins are either currently classified as high-priority or proposed to be classified as high-priority by DWR. The high-priority classification for these three groundwater subbasins is largely due to long-term groundwater level declines in the portions of the subbasins outside of the Delta. As part of the ongoing management efforts under SGMA, the NDGSA proposed to modify the existing groundwater basin boundaries to more accurately reflect the overlying management boundaries and local groundwater conditions. The NDGSA suggested creating a new groundwater basin—the Northern Delta Subbasin—by subdividing the three surrounding basins. This could create a smaller groundwater basin that is more homogeneous and therefore improve the potential for truly sustainable management of the resources. This could also improve the prospects of sustainable management in the neighboring subbasins by making those areas more uniform in terms of the subbasins’ characteristics and therefore easier to manage. The current positioning of the three subbasins in the area does not accurately correspond to the geopolitical boundaries of the region. For instance, portions of the Solano Subbasin are located in an area managed by Sacramento County even though the majority of Sacramento County’s SGMA management responsibilities relate to the South American Subbasin. The inconsistencies between the political boundaries and the groundwater basins increases the burdens facing entities, such as the NDGSA, seeking to sustainably manage groundwater resources. Compounding these management difficulties are the unique legal characteristics of the Sacramento-San Joaquin Delta. Beginning in 1959 with the passage of the Delta Protection Act, the Delta has become subject to numerous laws that apply solely to that area. 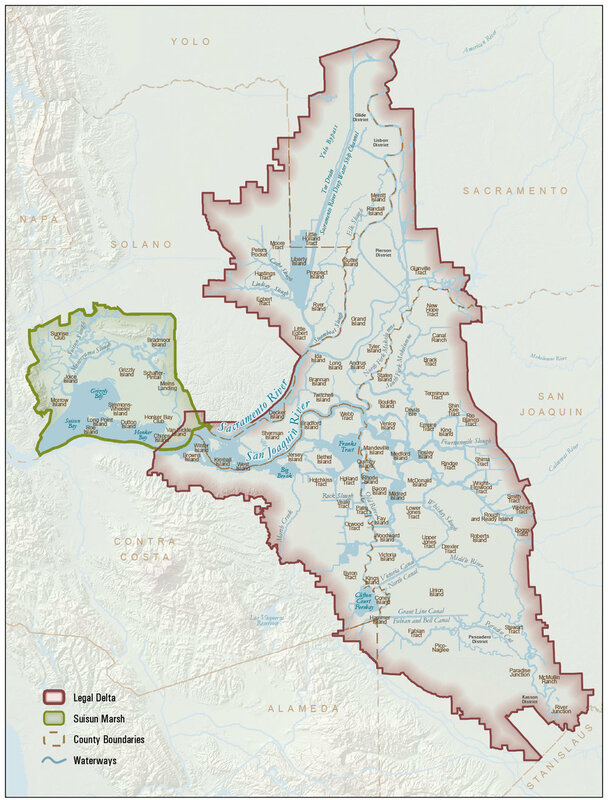 Furthermore, three state agencies—the Delta Conservancy, the Delta Protection Commission, and the Delta Stewardship Council—have specific authorities over the Delta. Numerous local agencies throughout the Delta also have management responsibilities for a variety of local land and water issues. This all results in a complex web of legal entities and regulatory programs. The NDGSA believes that the most functional and efficient way to minimize the complexities associated with managing groundwater in the Delta, and thus improve the potential for achieving sustainability, is to modify the groundwater basin boundaries. This would streamline management activities for all affected GSAs, making sustainable groundwater management of the entire region more likely to be realized by both fostering more homogeneous basins and helping to consolidate and focus management activities. The NDGSA submitted a Basin Boundary Modification proposal to DWR in 2018. The proposal sought to consolidate the member and partner agencies into one new subbasin (the Northern Delta Subbasin) and classify it as a “low priority” subbasin due to the unique characteristics and existing sustainable groundwater usage. DWR ultimately denied the request. In any case, the NDGSA remains dedicated to achieving more rational subbasin boundaries in the Northern Delta in the long term. If you have questions or comments please contact the Northern Delta GSA.